Rebirth Brass Band at the Sidewalk Steppers second line parade, 2011. The Rebirth Brass Band is the acknowledged leader of the new-school brass band tradition launched by the Dirty Dozen in the 1970s. Rebirth was formed in 1983 by Philip Frazier (tuba) and Kermit Ruffins (vocals, trumpet), while they were both students at Joseph S. Clark High School in the Treme neighborhood. Soon afterward, Philip’s brother Keith Frazier joined the band on bass drum. After their debut gig at the Sheraton Hotel in the CBD, the band began playing regularly in the French Quarter for tips. Rebirth attracted the attention of WWOZ’s Jerry Brock, who arranged a recording session with Arhoolie Records. The resulting album, Here to Stay (1984) was the first of fifteen albums the band has released. Rebirth became established on New Orleans’ parade circuit, incorporating many changes initiated by the Dirty Dozen, and the band took over the Dozen’s weekly gig at the Glass House bar in the late 1980s. In 1992, Rebirth began playing a Tuesday night residency at the Maple Leaf bar in Uptown New Orleans that has become the most celebrated weekly gig in the city. On original songs like “Feel Like Funkin’ It Up,” Philip’s prominent tuba riffs combine with Keith’s bass drum parts to create rhythmic momentum. 1989’s “Do Whatcha Wanna” (Mardi Gras Records) includes musical elements of second line parades such as tambourines, cowbells, clapping and crowd noise, and it reflects the energy of Rebirth’s young urban audience. As Rebirth became established as one of New Orleans’ most prominent bands, the addition of younger musicians and kept the band’s sound current. In the mid-1990s, Kermit Ruffins departed Rebirth to form the Barbecue Swingers, and Derrick Tabb, Stafford Agee, Glen Andrews, Tyrus Chapman and Derrick Shezbie joined Rebirth. While the influx of younger members brought hip-hop energy and style to the band, Rebirth maintained a repertoire that included funk, R&B, and traditional brass band tunes. An example of this blend is Rebirth’s cover of James Brown’s 1970 protest song “Talkin’ Loud and Sayin’ Nothin’” which was developed between shows while the band was on tour in the Pacific Northwest. The band reworked the tune with no chance to rehearse before playing it onstage. Derrick developed an innovative drum roll for the song’s introduction, and the band transposed the original tune from a major to a minor key, while only retaining Brown’s lyrical refrain “You’re like a dull knife / That just ain’t cuttin’ / You’re talkin’ loud / And sayin’ nothin’.” In “Talkin’ Loud,” Rebirth demonstrated its ability to play diverse repertoire in innovative ways. 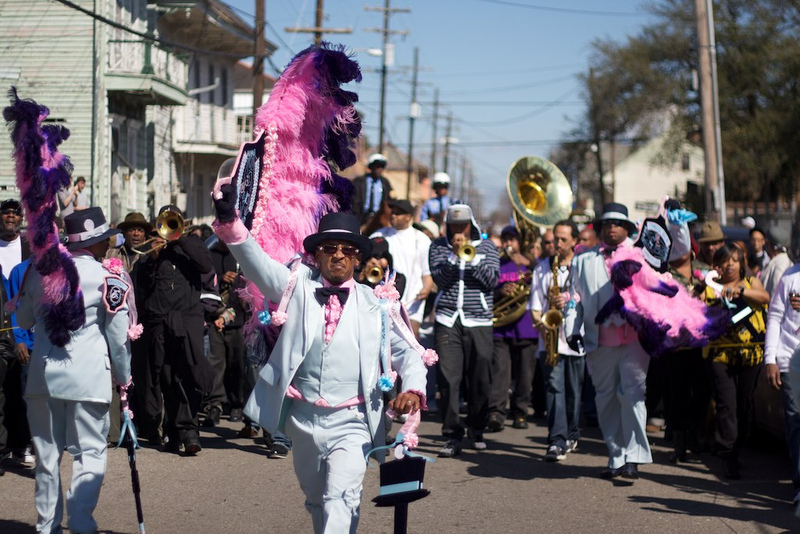 In addition to constant touring, Rebirth’s continued presence at second line parades and community festivals has solidified the band as one of the city’s premier brass bands. Rebirth was recognized with a Grammy award in 2012 for their album Rebirth of New Orleans. This neighborhood provided me a deep scope for the game of life, its classroom was onr that was never boring. The people represented love for the history, music, tradition, food and La’chayim.